The U.S. Air Force 412th Operations Group is using Alpha Jets as test support units for chase planes. The move comes in an effort to augment the service branch’s chase plane fleet that delivers visual feedback and documentation to provide safety support, Edwards Air Force Base said Monday. 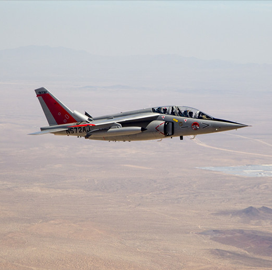 Modern Technology Solutions and Gauntlet Aerospace provided the Alpha Jets used at Edwards AFB for test sorties. Christopher Klug, 412th Operations Group technical director, said that the Alpha Jets address the mission’s needs that do not require the F-16, which serves as the primary test support aircraft. He added that the Alpha Jets are suited for shorter-length test support missions done within a 30,000 feet coverage and under 0.8 Mach speed or around 613 miles per hour. The jets have so far participated in tests with F-16, F-15, F-22, B-1 and F-35 aircraft, the director said. Officials will analyze gathered test data to determine the future use of Alpha jets.